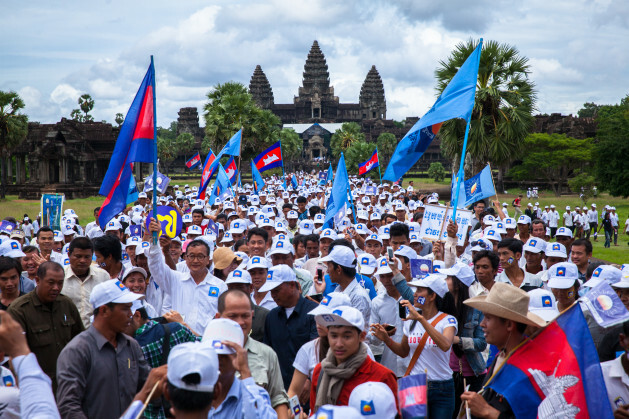 Cambodia National Rescue Party supporters walk in support of opposition leader Sam Rainsy [left, holding flag] in Angkor Wa. Credit: Erika Pineros/IPS. ‘Change’ is their main slogan as they campaign for the opposition party on the streets of the capital every day. They are hoping to make a dent in the dominance of the ruling Cambodian People’s Party (CPP), which currently holds 90 out of 123 seats in parliament. The CPP government has been led by Premier Hun Sen for 28 years. “Supporters for the [opposition] Cambodian National Rescue Party (CNRP) totally outnumber the Cambodian People’s Party,” 23-year-old activist Sek Sokunroth told IPS in the capital Phnom Penh. Half the country lives on two dollars a day, making five dollars a tidy sum of money to ‘work’ the campaign trail. Srun Srorn, civil society election observer for the CAM ASEAN Youth Advocacy group, said times have been hard for youth, particularly for those who migrate from the countryside to the cities to work for monthly wages as low as 60 dollars. From this income many try to send remittances to parents who have lost out due to land grabs from dubious foreign investment. The growing wave of evictions has left an estimated 20 percent of Cambodians landless. It is this disenfranchised group that is keen on change. The rising discontent got an unexpected boost when opposition leader Sam Rainsy returned to the country Jul. 19. He was greeted in Phnom Penh by about 100,000 supporters and a royal pardon from the King. Self-exiled in France since 2009 to avoid charges levelled by the ruling party, Rainsy told supporters the country was at a “turning point” and that he was ready to risk his life to bring change. Young CNRP supporters did not experience the Khmer Rouge years 1975 to 1979, but they saw the impact it had on their parents. “People that lived during that time have bad dreams and nightmares every night,” said Sokunroth. “Compared to the last elections, this year is more exciting with many more supporters prepared to stand up and say the things they want to say,” said Srun. He looks to the government, NGOs and international bodies to collaborate to reduce unrest. The secretary general of the CNRP in North America, Pretty Ma, said they are working for a contingency plan in case of strife. “We do not think that violence is the way to solve problems. We plan to appeal to the government [of Cambodia]. It is their responsibility to address that.” North American party representatives are also looking for support from U.S. congressional representatives. Cambodians abroad like Pretty Ma, many of who migrated in the Khmer Rouge years, have been instrumental in garnering some international support for their homeland. Sam Rainsy grew up in France after fleeing Cambodia’s war with his family as a child. Researcher Gea Wijers of the Netherlands has studied Khmer living abroad looking to return to help build their homeland. She told IPS they struggle to reconcile their experiences of democracies with those of Khmer living in the homeland who have yet to know it. The Failed State Index for 2012 declared the country at ‘warning’ level, ranked at 41 out of 178 countries, just five spaces below Congo (Republic) at 36. Cambodia earned particularly poor marks in the “rise of factionalised elite” and “legitimacy of the state”. With these structural flaws, the country faces many obstacles that might be greater than its current youthful desire to transform the system. How Rainsy guides his supporters through the election outcome will be watched keenly.